I've found an usual case where a variant disappears during the hard-filtering workflow. After joint genotyping GATK outputs a HET true-positive SNV 11:2906165A>G and a deletion. This row is absent from both output VCF files. 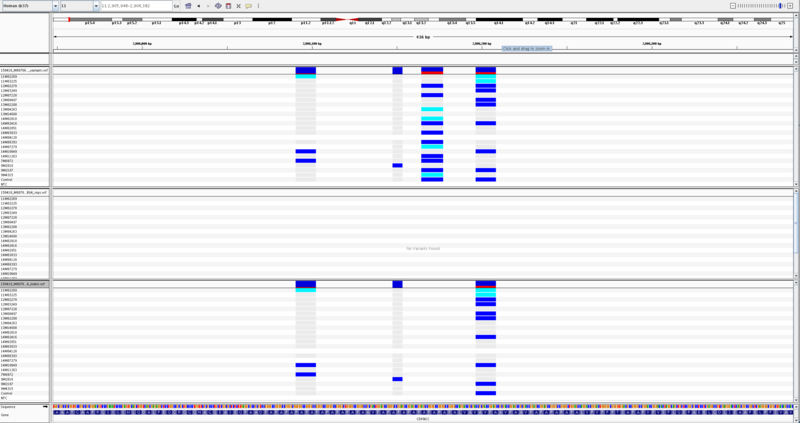 See attached screenshot (order: all, SNPs, Indels). That would be -selectType MIXED I believe. No, it does not sound nuts. Right now, VQSR considers mixed sites as INDELs. We realize this is not ideal, so we added some allele-specific annotations which address this issue. You can learn more about them in the annotation documentation. However, we do not have any Best Practice recommendations with those allele-specific annotations yet. @Sheila Thanks thats really helpful!